A moody, birdseye view looking down a narrow stairwell at the Arc de Triomphe in Paris, France. Viewpoint, sometimes referred to as angle of view, is a critical consideration for the photographer working towards a great composition. This photo was made at the Arc de Triomphe in Paris, France. The steep climb up the spiral staircase leads to the roof where you soak up fantastic 360 degree views of Paris. While staircases are interesting, the curved shape of a spiral staircases is quite unique. When viewed from above they remind me of a nautilus shell, symmetrically perfect. The fact that I created this image from such a high viewpoint really helps tell the story associated with the climb up to the top of the Arc de Triomphe. It's the physicality of our journey that's often not all that well communicated in the images we make. Does that matter? Well, in an image like this one, I think it's an important part of the story that also helps prepare other travelers for what's in store should they decide to more fully explore the location. In fact such an extreme angle of view is referred to as a Birdseye Viewpoint. It provides a way of seeing the world that's so different from the way we normally perceive it. I'm reminded of the story I heard once about the first hot air ballon flights over Paris. They provided a perspective of Paris never before seen. I made the above photo with a Canon 5D Mark II camera and a Canon 24-105 mm f4 IS lens @ 24 mm. That's the wide angle end of that particular lens and, because wide angle focal lengths alter perspective, it enabled me to move in close and emphasize the stairwell. 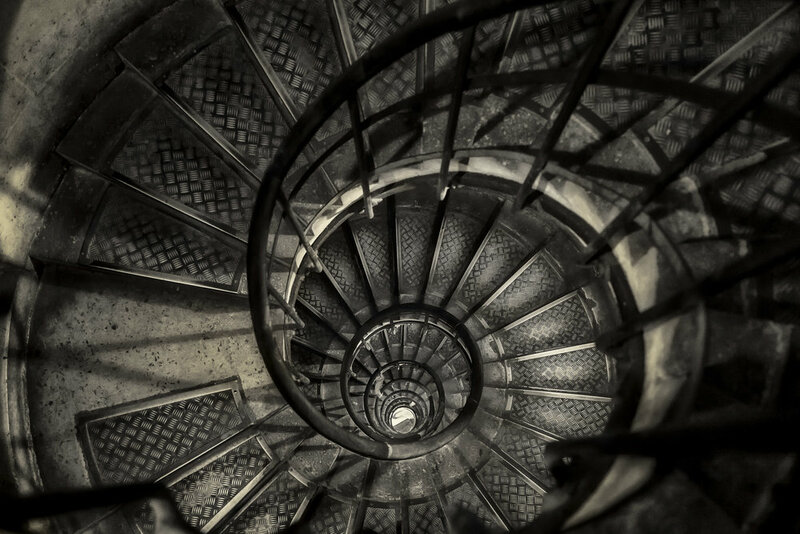 A worms eye viewpoint provides a dramatic perspective of the stairwell that leads up to the top of the Arc de Triomphe in Paris, France. The opposite to a birds eye viewpoint is referred to as a Worms Eye Viewpoint. As you can see, from the color image of that very same stairwell, that by photographing from a very different viewpoint you can explore the structure in a totally different way. Of course the warmth, coming through the incandescent lighting, also provides a sense of nostalgia which I think is appropriate to this particular image. I suppose the key understanding from this post, in addition to a few definitions from the world of composition, is that places, events and relationships come and go during our time in this world. What matters most is what we make of those experiences and how we interact with people along the way. I strongly recommend that you consistently explore viewpoints that produce more variety in your own photography. It's easy, fun and often the single action you'll need to take that elevates the image from ordinary to something quite special. Give it a go and, remember, that photography is a physical endeavor.